We checked out the Artichoke guys newest shop this past weekend- This Little Piggy. I’ll admit, when it comes to Roast beef sandwiches the bar is set pretty high. Growing up in Buffalo you get a real appreciation to all thing beef- especially the quintessential Western New York favorite Beef on Weck. 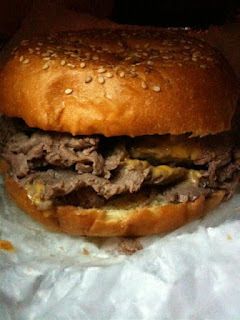 However I know there’s no weck in this city so regular roast beef sandwiches have to fill the void. This Little piggy makes two kinds of sandwiches called This Way and That Way. This Way is Roast Beef with Cheez Whiz and au jus. That way is Roast Beef with fresh mozzarella and gravy. Neither of us were in a gravy mood so we went for That Way. Upon opening up this large sandwich it was evident that they used a lot of us jus…I mean a lot! The bottom of the roll was so soaked through it proved to be no match for the weight of the beef and completely fell apart. This might upset some people but I love au jus so it was just fine with me. Unfortunately the meat itself wasn’t great. The beef was overcooked and even with all of the juice it tasted a little stringy and dry. It wasn’t a horrible sandwich but it just wasn’t as good as I expected. We also got an order of their steak fries. 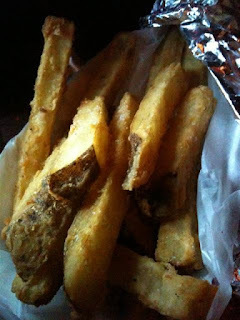 I’m not a big fan of steak fries but these were actually quite good. Really crispy and well salted. Overall I thought This Little Piggy was just okay. I think the sandwiches and fries were good but not something to go out of your way to eat. However I could see this being amazing drunk food. Next time I’m out having a few beers in the East Village I may have to test my theory out.